With the capacity to treat 370 million gallons of water per day, the Blue Plains Advanced Wastewater Treatment Plant is the largest in the world, and what it does with its waste is creating buzz around the world. The plant can now produce up to 10 megawatts of power from its waste – an amount of energy that could easily power thousands of homes. Blue Plains is managed by the District of Columbia Water and Sewer Authority (DC Water) which provides drinking water, sewage collection and sewage treatment to the residents of the Washington D.C. metro area. 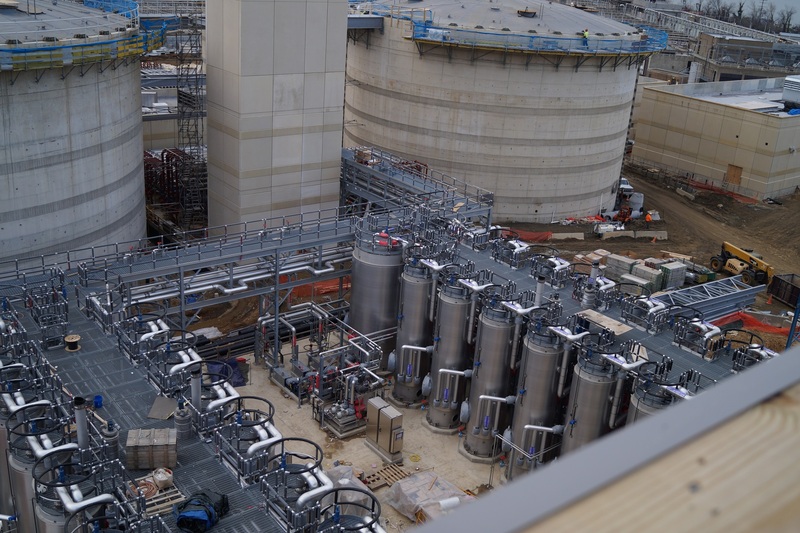 More than ten years ago DC Water began planning for what is now considered to be one of the most sophisticated wastewater treatment plants in the world. The facility sets a new quality standard for water treatment while substantially reducing its carbon footprint. Electrical Alliance contractor, Singleton Electric Company, Inc. was awarded the design-build contract from DC Water. To begin the Main Substation project for DC Water, Singleton completed a rigorous research process of the plant’s existing electrical distribution and control wiring. They also focused on coordinating with plant personnel in preparation for outages, load shifting, and commissioning. For the project, they used digesters to capture the waste. The process captures the methane from the waste and converts into electricity used to power the plant – which is important since Blue Plains is the biggest electrical user in the Washington, DC area. The new combined heat and power (CHP) system will provide more than a third of the energy DC Water needs to run the plant, significantly reducing its costs while producing less Co2. “There are other plants in the world that treat more flow than we do, but they don’t treat to the same standard that we do,” said Chris Peot, director of resource recovery at DC Water. To be as efficient as possible, Singleton broke its part of the project into three phases. Each phase consisted of replacing the incoming 15kv bus duct and outdoor transition from the 69kv to 15kv transformers, splicing new 15kv feeders to existing duct bank distribution in a new cable vault structure, and installing an independent steel floor-mounted conduit support system for the new 6-inch rigid conduits into the new cable vault building. By completing the work in three phases, Singleton avoided interruptions of the plant’s electrical system. While the CHP process is becoming more common among wastewater treatment plants, it’s Blue Plains’ process that makes their system especially unique. “We have a very unique pre-digestion process, called thermal hydrolysis. It’s the first one in North America, and the largest in the world,” explained Peot. Blue Plains receives visitors from all over the country who want see this new system in action. Singleton also received WBC Craftsmanship Awards for their work on the Blue Plains project. “We’ve got a ton of people coming through and looking at this. A lot of people are planning to implement this same process now that they have seen it work here,” added Peot. Unlike most innovations that take place in the wastewater treatment industry, this project was not mandated by a federal court order. DC Water’s board made the decision that the initial investment wound be well worth the end results. And with savings in electrical costs of about $10 million a year, it seems they were right.